Adam Sandler, star of such movies as "The Wedding Singer," "The Waterboy" and "50 First Dates," has signed an exclusive deal with Netflix to make four movies that will be released only on Netflix (NFLX), not in theaters, according to the company. Sandler's Happy Madison Productions will co-produce the films. Neither Sandler nor Netflix has released any details of what the films would be about, nor have they said when the films might be released. The movie industry generally works years in advance to scheduling filming and production around financing and the availability of stars. According to Netflix, Sandler is one of the "few actors whose films consistently rank among the most viewed by Netflix customers." In the statement, Netflix Chief Content Officer Ted Sarandos said, "People love Adam's films on Netflix and often watch them again and again ... not just in the U.S. but all over the world." %VIRTUAL-pullquote-I immediately said yes for one reason and one reason only. Netflix rhymes with Wet Chicks. Let the streaming begin!!! !%Sandler was quoted as saying, "When these fine people came to me with an offer to make four movies for them, I immediately said yes for one reason and one reason only. Netflix rhymes with Wet Chicks. Let the streaming begin!!!!" The deal illustrates a big shift currently happening in Hollywood. Internet-based companies such as Netflix, Amazon.com (AMZN), and Google (GOOG) are commissioning and producing new video entertainment for their online audiences without the participation of traditional studios. Sandler is currently working on several films that aren't part of the deal, according to the Hollywood Reporter, and it's unclear how this deal might affect his ongoing arrangement with Sony. 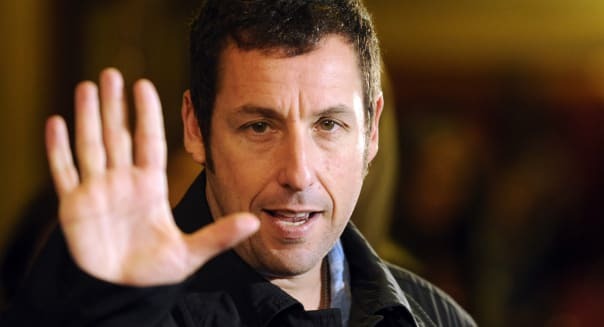 Although some of his recent films have been financial disappointments, Sandler has historically been a top box-office draw; his films have grossed a total of $3 billion globally. Bringing on Sandler is a further development of the emphasis Netflix has placed on original productions, including the series "Orange Is the New Black" and "House of Cards." Recently, Netflix also announced that the martial arts sequel "Crouching Tiger, Hidden Dragon: The Green Legend" would premiere simultaneously on its streaming service and in IMAX theaters, and that it was co-producing a new television series from Judd Apatow, Paul Rust, and Lesley Arfin.